Catholic Church | Another Beautiful Day in Paradise! Happy Boxing Day, as they might say in the UK! We had a simple and quiet Christmas here at Casa Poolman. I am about half way through a week-and-a-half long holiday break. Within the University System, we bunch several holidays in the week between Christmas and New Year’s Day and close down the institute for a week. I added a couple of vacation days to that run, so I will have off from the Saturday before Christmas through New Year’s Day. I love it. Unfortunately, Mrs. Poolman is not so lucky. This was the year she was scheduled to work 12-hour shifts both Christmas Eve and Christmas. It stinks, but what can you do? I spent the first half of Tuesday putzin’ around and taking care of last-minute Christmas preps. 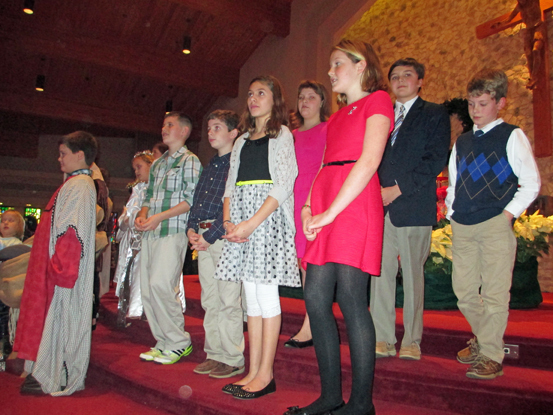 My CCD class provided the readers for a short Christmas Pageant during the 4 o’clock Mass. Everyone we were expecting showed up, and more-or-less on time. Yea! Last year, we had one child who missed all but one practice, but we agreed to let him participate after his mother called up and practically begged us to do so. Then “mom” failed to deliver him on time. We rearranged the readers to cover his slot, but he came running up just as we were walking into church for the start of Mass. I don’t blame the child, but the mom taught us a lesson we won’t forget. No such drama this year. Our students all did great. After constant encouragement, they all read loud enough that the congregation could actually here them. Yea again! Mrs. P got home around 8 o’clock and we split a pizza for dinner. Very fancy. On Christmas morning, I got up and drove about 45 minutes out in the country to my daughter’s in-laws. Brad and Annie are great. It was very nice of them to invite me out for Christmas brunch. Writer Princess is very lucky (and so are we) that she has such a great set of in-laws. They a house on several acres out in the boonies. Annie has taken to raising livestock. 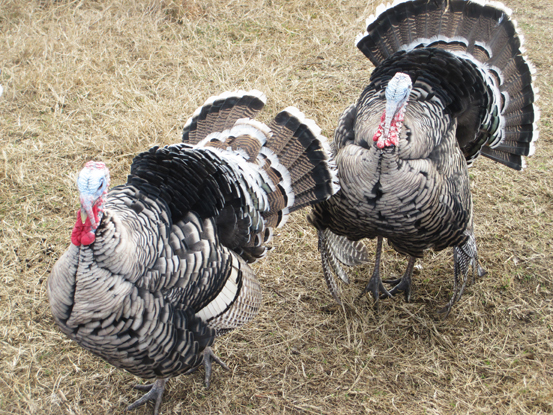 She has turkeys, chickens, “runner ducks,” guinea fowl and goats. 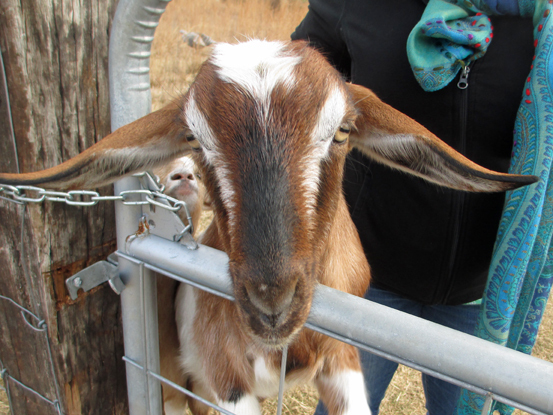 The highlight of yesterday’s visit were two week-old baby goats. Very cute! Back home in the early afternoon and started preps for dinner. I planned on a boneless rib-eye roast, twice-baked potatoes, green bean bundles and creamed pearl onions (Mrs. P’s creation ahead of time.) Everything went well, even the green-bean bundles, which were a little more effort than I originally planned. Mrs. P got home around 7:30 pm and I handed her a vodka and tonic. The rest of our dinner guests included son, girlfriend, daughter, son-in-law, and son-in-law’s brother. I planned to take a picture of the meal, but, frankly, I was so wrapped up in getting it all together when it was time to serve, I just forgot. Some friends/neighbors walked down as we were finishing dinner. 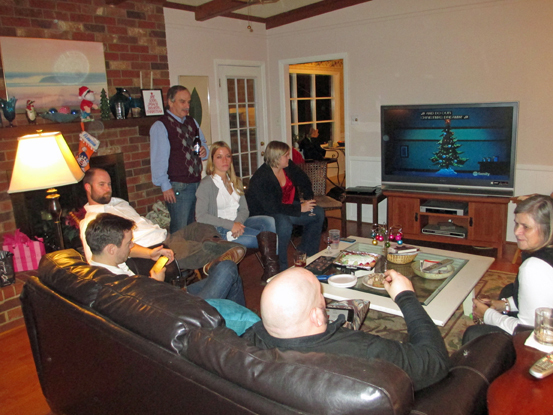 We all gathered in the family room to open presents and visit. I wish Mrs. P had been around for more of the activities, but given the circumstances, it was a pretty nice holiday. 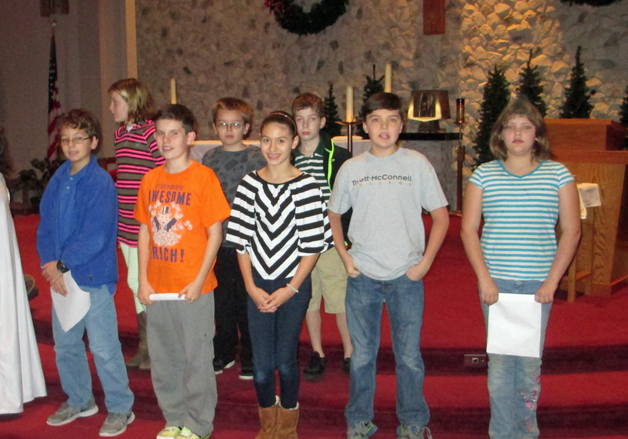 My 5th grade CCD class has been busy since the Thanksgiving break preparing for our Christmas pageant. My class provides the readers for a fairly simple production. They read the Christmas story, while the third grade class acts out the drama, dressed as Mary, Joseph, shepherds, and so on. We have had three practices, and so far, while it won’t be a Broadway production, it won’t be a fiasco either. But it did come close. Initially, one of the co-teachers volunteered her one-year old son to play the role of the baby Jesus. This was not a great idea. Young Brady was entirely too much into crawling and pulling himself up on anything that was handy. One of the third-graders (who is playing Mary) is disabled and has a motorized wheelchair. Brady pulled himself up onto the front of the chair and grabbed onto the control knobs. The chair took off with Brady hanging on for dear life. Until they ran into a pew. The fifth grade reader team. The big show will be at 4 pm Mass on Christmas Eve. Looking forward to it. While we are on a Christmas theme, our friends Sam and Beth stopped by the other day with our “adopted grandchildren” Helen and Brittany. 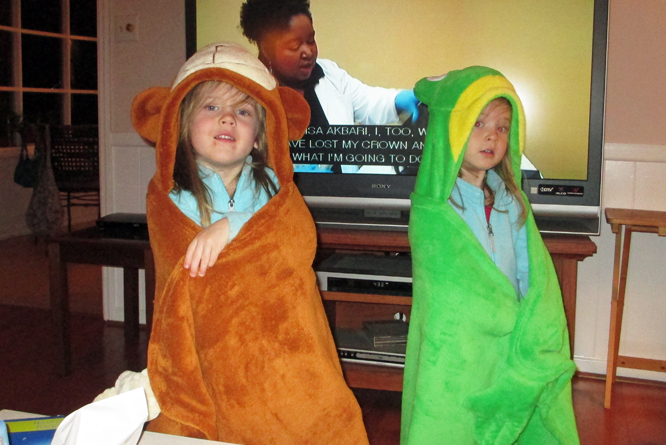 Mrs. Poolman and I got them each an animal-theme throw-blanket. One was a frog and the other a monkey. Too cute! In some of my past posts, I have mentioned what a good time my co-teacher and I have been having with this year’s 5th grade CCD class (Catholic religion classes for kids who don’t go to the parish school.) Now I’m feeling guilty. I know there are plenty of kids out there with Asperbergers, autism, out-of-control ADHD, serious family problems and other issues that may make them behavior problems during our short hour together on Wednesday nights. They need love and religious education too. I’m just glad for maybe only the second class in nine years, I don’t have to deal with a whole bunch of them. I’m feeling guilty because we actually have it pretty easy this year, and my co-teacher and I are enjoying it. Our class this year is small, only 13 students. Typically our class sizes are closer to 20-25. And for the most part, this is a nice, well-behaved group. I have only one male student who seems to have difficulty sitting at his desk without falling out. As a group, they are not perfect, but they are good natured and manageable. The best part for both them and us is it allows Mrs. R (co-teacher) and I to do different, and more interesting things when we don’t have to worry about pulling kids off of the light fixtures. For example, this week we had them break into groups of two or three and brainstorm ways they can continue to serve God and their neighbors after they leave Mass. With some classes, even doing that much was a recipe for chaos. However, this class handled it. When we asked them what they had come up with, the first group said they wanted to act it out with charades. Mrs. R was not in favor, but I thought it was worth a shot. 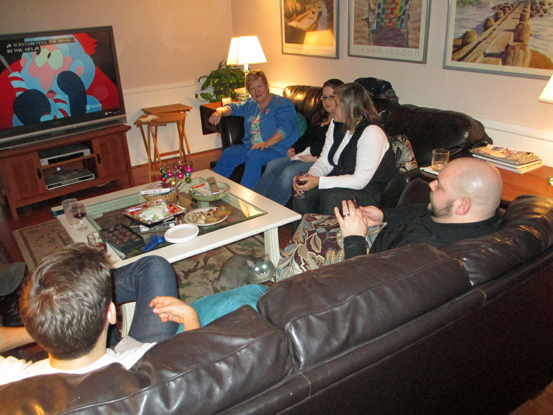 As it turned out, every one of our groups acted out their “charade” very well. We ended up going around the class three times. It was a little rowdy, but nothing totally out of control. The students enjoyed it. Since they actually had to engage in the activity, maybe some of what we did may actually stick with them. One can always hope. For the ninth straight year, I am back teaching 5th grade religion classes at our parish church. Protestant churches would probably call it Sunday School, but since we are Catholic, it is called CCD and the classes are held on Wednesday evenings. These classes are for the children who attend public and other private schools other than our parish school. As I have detailed in the past, my experience teaching CCD has had its ups and downs. We have had some really great classes, and we’ve had some that caused me to almost dread showing up on Wednesday evenings. Just two classes into the 2013-14 year, my co-teacher and I are cautiously optimistic that we have a pretty good group. So far they have been polite and respectful, while still participating in the class discussions. Having a group that is reasonably well behaved and cooperative is better for more than just our sanity. If we have a class that will work with us and work with each other without descending into anarchy, we can make the class much more interesting, for both the students and teachers, through interactive activities and more interesting discussions. That having been said, we also realize that our students are ten and eleven years old, and our class comes at the end of a long day in school. In adult terms, their CCD class is overtime for them. We don’t expect perfection; we just don’t need it to be a constant struggle. Here’s hoping the rest of the years goes as well as the first couple of weeks have. We have been busy for the past couple of weeks. Our CCD class came to an end a few weeks ago. Mrs. R, my co-teacher and I bought pizzas for the kids and one of the parents provided the drinks. It is always funny when we do this on the last class. You would think the 5th graders had never seen pizza before. We finished off with a “quiz bowl” on all the material we had covered throughout the year. Good news and bad news. The bad news – some of the kids clearly were mentally AWOL during the year, or maybe the pizza caused their tiny brains to shut down. For example, the major theme of the year was the seven Sacraments. You would think that three students, working together could name all seven. No such luck. The one they missed? Reconciliation, which they received during our CCD class just a couple of weeks earlier. Duh? On the other hand, one of the girls, who was usually an attention-seeking wild child, was knocking down the answers like a pro. We always knew she was there; we just weren’t certain she was listening. Mrs. Poolman had two cataract surgeries this month. For obvious reasons, they don’t do both eyes at the same time. Both were fairly non-eventful. Mrs. P has been all excited about it because the doc used some new multi-focus lens. It means that for the first time in her entire life, Mrs. P can see clearly without heavy-duty glasses or contacts. Yea! 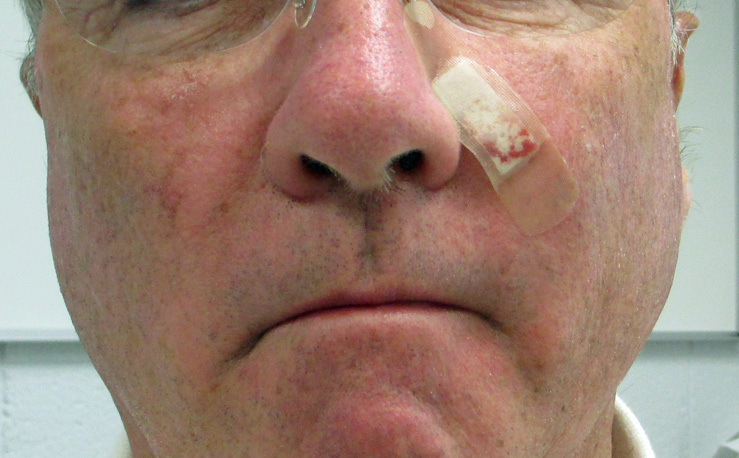 The whole procedure probably took 5 minutes. No big deal. The only “weird” part came when it cauterized the cut. Since it was right next to my nose, I not only felt the heat, but also smelled the smoke. Very strange. So I’ve been wearing a band aid for the past week and a half. I am not much into music, especially religious music. In church I try to sing along, or at least lip sync, when I know the song. However there is no way I can contribute to a song I haven’t heard enough to recognize the melody. I told her I had been to many funerals as a child (more on that in a moment), but fortunately, I had not much opportunity to do so lately. During the course of the conversation, I recalled a television show that had a short run in the 1990s that focused on an urban Catholic parish. I couldn’t remember much about it, but I did remember one episode that concerned the death of a nun and a beautiful rendition of “On Eagle’s Wings” at her funeral. Mrs. Poolman has accused me of being a bit obsessive on more than one occasion. I do hate to leave mysteries unsolved. When I got home, I got on-line and tried to locate this program. Actually, a quick Google search for “tv, drama, catholic, priest” turned up the answer in nothing flat. “Nothing Sacred” was an ABC network program that had a short run in 1997-98. Beyond that, it turns out there are a number of episodes on YouTube. Since the show had only a short run, it was pretty easy to narrow down the episodes to find the funeral scene. Here it is. The clip is of the entire last segment of the show. The song starts just past the 9-minute mark. So, why, you might wonder, did I attend so many funerals as a child? It had nothing to do with dying family members, although there were those too. I went to a Catholic grade school, and my sixth grade teacher, Sister Mary Leonard, was also the musical director for the parish. Fairly frequently, when she was called upon to play music for a week-day funeral. Usually there was no substitute teacher available, so Sister just brought the class along for the funeral. Three to four times a month, a grieving group of family and friends would show up at St. Vincent de Paul Catholic Church to say farewell to a loved one, and there, sitting in the back rows of the church, were 40-45 sixth graders. We were all well trained on the proper procedures and etiquette of the Requiem Mass. We knew all the responses and the words to most of the hymns. Looking back on it, I am a little surprised at how well behaved we all were. However, by that time, we were all veterans of a number of years of parochial school, weekly Masses, monthly confessions, etc. We were well aware that any cutting-up during a funeral Mass, might result in a lightning bolt from the choir loft. In any case, it would not be a pleasant experience. We knew what was best in the long run. As I have written in the past, I am involved teaching a fifth-grade religion class at our church. We are Catholic, so this class is for the kids who do not attend the parish’s parochial school. Most Protestant churches would call it “Sunday School.” In the Catholic Church, it’s called CCD. Classroom management is an issue for me. Part of the problem is I wear hearing aids, so keeping track of multiple voices is very difficult. I have a co-teacher who is essentially my “enforcer.” She was not able to attend this week, so Mrs. Poolman came along to help. At one point she asked me, “You don’t get paid for this, right?” When I pointed out that she knew this was a volunteer job, she replied, “I knew you were a little crazy, but not this much.” Thanks for the support, Mrs. P! I think there are several issues involved. The biggest is the class meets for an hour on Wednesday evenings. The students have already been in school all day, and this is “overtime.” We are seriously infringing upon their leisure-fun time. While I try hard to make the class as interesting as I can, sometimes the activities I design to break up the routine are counter-productive. This week I planned a small-group poster activity. But once the groups got together, they decayed quickly into chaos. They were much too distracted by cutting up with each other and arguing over what color markers to use, to actually complete the assignment. –One little girl who is desperately needy for attention. Her way of getting it is to stir up trouble with anyone who is around her and then blame them for the disturbance. –A few loud, high-energy (ADHD?) boys who have a compelling drive to be the center of all attention. They just roll over the quiet kids. –A group of socially active “tween girls.” They are not intentionally disruptive, but they are constantly “a-twitter.” They just love to chat with their friends. Next week, we’ll try it again. Since our last lesson was a total bomb, I’ll need to recover the same material, but in a more traditional style. I hope I’m getting gold stars on my record somewhere for all this. Sigh.